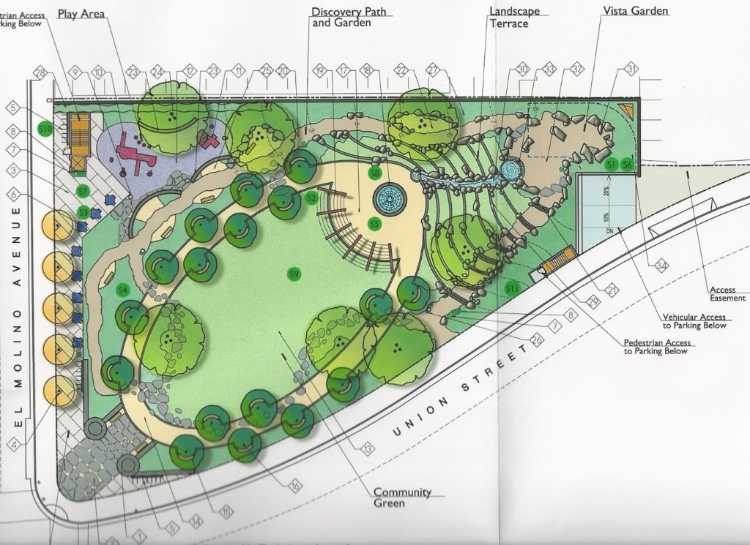 A new park behind Vroman’s Bookstore gets the green light from City Council. Playhouse Park will help to fill a park-starved gap in Downtown Pasadena, and finally after years of advocacy, the Residential Impact Fees that new residents have paid will start to yield benefits for the people who paid those fees. 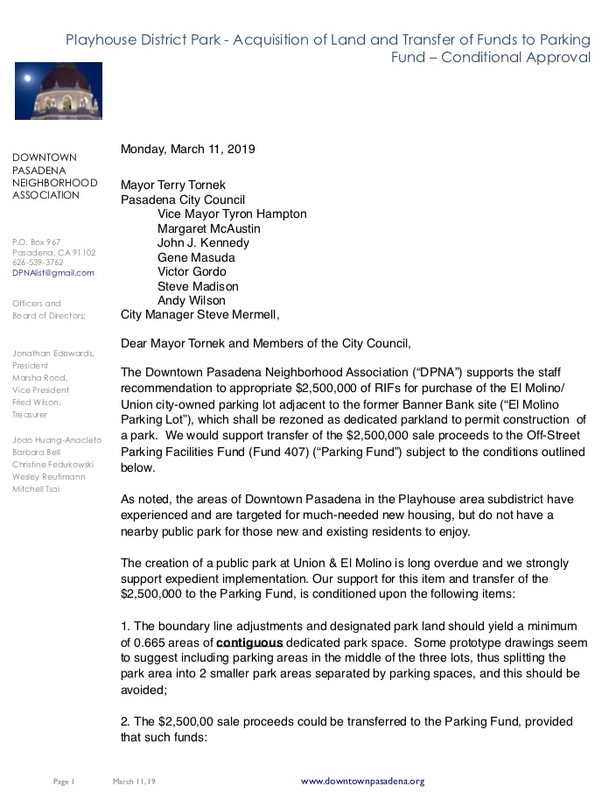 Remember the “Park Now” workshops that the Playhouse District Association held in 2010, in which the community helped design a park for the lot at Union & El Molino? It’s been a loooong time coming…after funding dried up in 2010, the city, the business district, and neighbors have been struggling to find a solution. 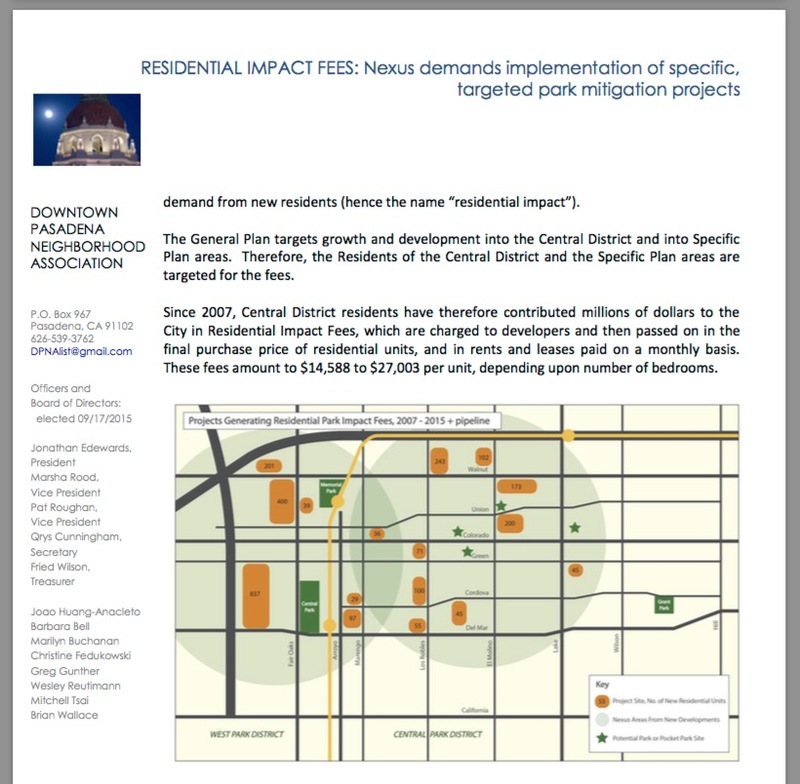 The DPNA fought a dangerous change to the Residential Impact Fee ordinance that would have diverted even more funding away from Downtown parks (the ordinance is still currently inequitable and still needs fixing… more info below). The city purchased the Banner Bank site. Councilmember Andy Wilson brought together stakeholders to help resolve some key issues. The business district (PDA) underwent a strategic plan. HOAs organized in favor of a park. They even set up time-lapse photo surveillance of the parking lot to prove that the public parking was actually going unused by 50% on average. Laemmle’s Theatre relocated parking spaces for which it had rights. On Monday night, March 11th, 2019 the City Council appropriated funds and directed staff to amend the Municipal Code to designate the former Banner Bank site and ½ of the public parking lot at El Molino & Union as a Public Park. In addition, the city will hire a landscape architect to design the park, and conduct several community meetings to gather input on the park design. At least 48 parking spaces will remain on the lot, and the parking area will be designed as flexible event space so that farmers markets, festivals, arts & craft fairs, etc can be held on the lot. Hooray! Stay tuned for those future design workshops. HERE IS OUR FULL LETTER TO CITY COUNCIL. 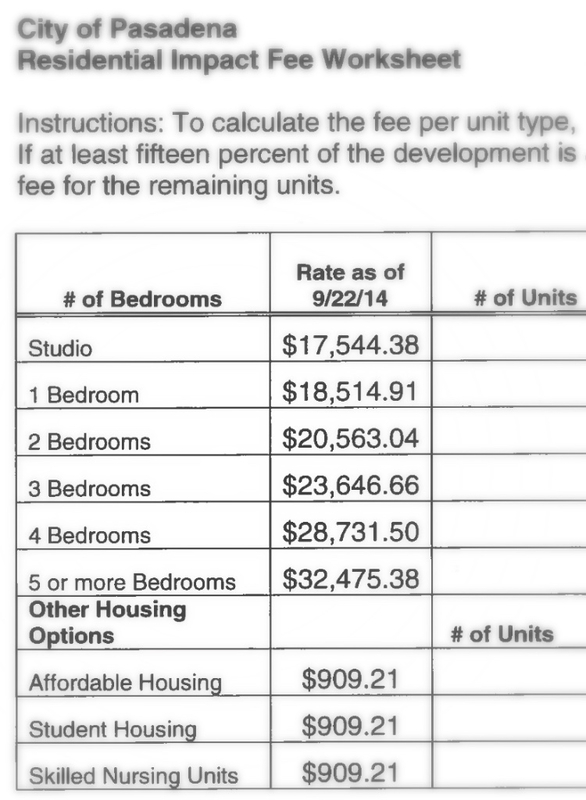 More info about those “Residential Impact Fees” is below. Residential Impact Fees (RIFs) are assessed for the specific purpose of satisfying the additional demands on parks that new residents create. 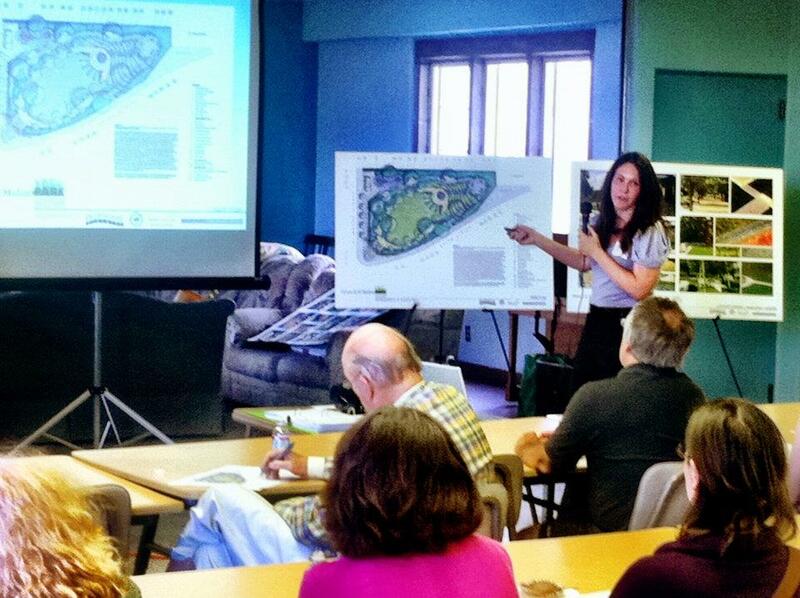 New residents = additional impacts on parks. READ OUR FULL LETTER TO CITY COUNCIL. “Playhouse Park” design by Korn Randolph, for corner of El Molino & Union St. When this park was being proposed, the Residential Impact Fees fund (in the “Central” park district) was empty. “Park Now” proponents of the Playhouse District park had to seek funding elsewhere, by applying for a state grant, which was unsuccessful. 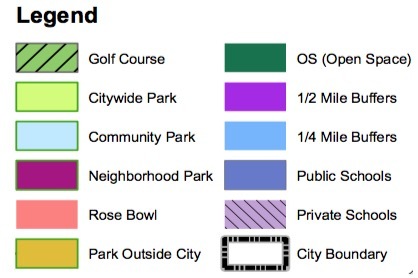 As it stands, the city is divided into 3 “park districts”, pictured below. Park fees have to be spent in the district in which they are collected. This 3-district division does nothing to insure that the fees are spent close to the apartments & condos building from which they are collected. In addition, the 3 districts are a clunky, arbitrary division that has resulted in lots of funds in the West District (because of the Westgate project, etc), and fewer funds in the Central and East District. The 3 “Park Districts”. A new apartment building built in the “West” district would be taxed the Park Fee, and those fees have to be spent in the “West” district, for example. Ideally, a resident should be able to WALK to a nearby park. However, the districts are so large that there is only a driving relationship (or “nexus”) between where the funds come from and where the funds are spent. How much did you pay in Park Fees? How much is built into your rent? *Projects built before about 2005 were not assessed a fee. Fees are paid upfront by developers when they pull a building permit and trickle down to unit owners and renters indirectly. The actual economic consequences to unit owners and renters is complex and is dependent on how developers respond to increased costs (which effects the supply of housing and therefore the overall price of housing), whether or not fees are actually used to improve parks nearby, and how the market responds to such park improvements, among other factors. The majority of Park Fees are collected from new apartment & condo buildings that are built in Downtown—the Central District. There is a large “gap” in Downtown with no park. 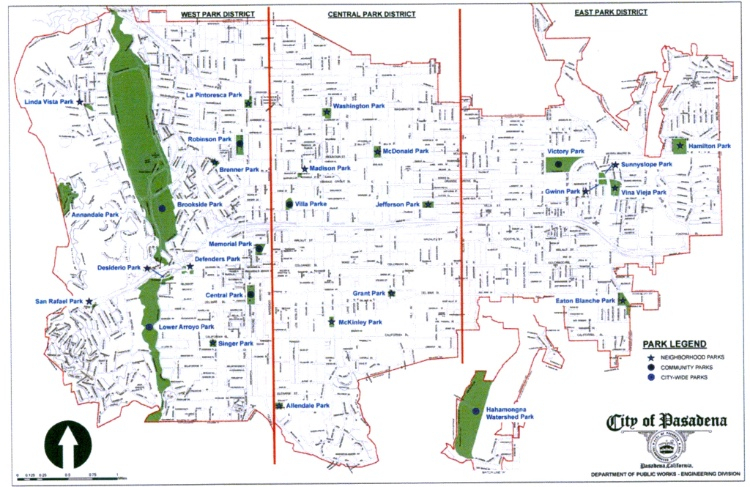 Green Space “Gaps,” where parks are more than 1/2 mile away (grey areas). The Downtown Gap (#1) has the highest population. There are about 20,000 residents in Downtown Pasadena. 1/7 of the city’s population. The majority of Downtown residents (12,000 – 16,000 residents estimated) live more than 1/4-mile from a park, and many of those (probably 8,000-12,000) live more than a 1/2 mile from the closest park. 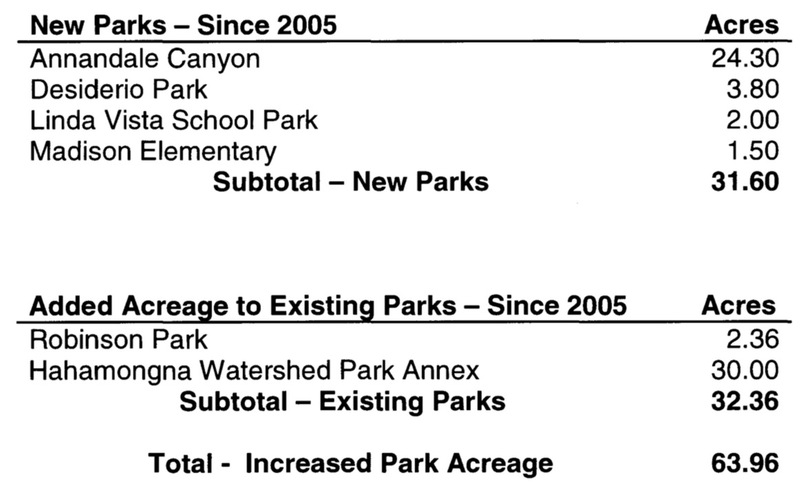 So… where have new parks been built from the $19 Million raised in Park Fees? ANSWER: Not in Downtown Pasadena. In fact, the city is proposing to reduce or eliminate the Civic Gardens in front of City Hall, by building the YWCA-Kimpton Hotel project, further reducing park space in Downtown. The “YWCA-Kimpton Hotel” proposed project that directly faces Pasadena City Hall. In the 1920s, the voters of Pasadena purchased the land on which City Hall sits, and surrounding parcels for the purpose of creating a “City Beautiful”-style City Hall surrounded by Public Gardens. The current proposal will destroy the gardens and place the rear-end of a hotel facing City Hall, with private hotel rooms on the ground floor. However, some of the funds were spent to improve existing parks, including a new playground in Central Park. 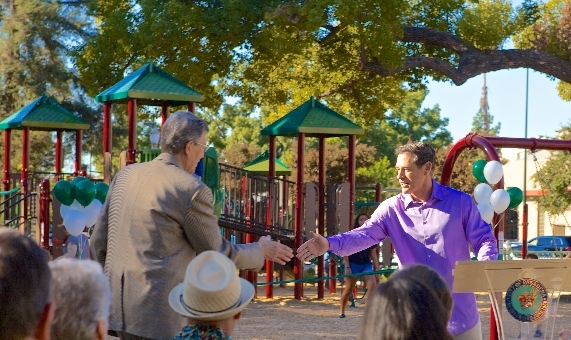 Steve Madison and Bill Bogaard at the dedication of Central Park’s new playground. 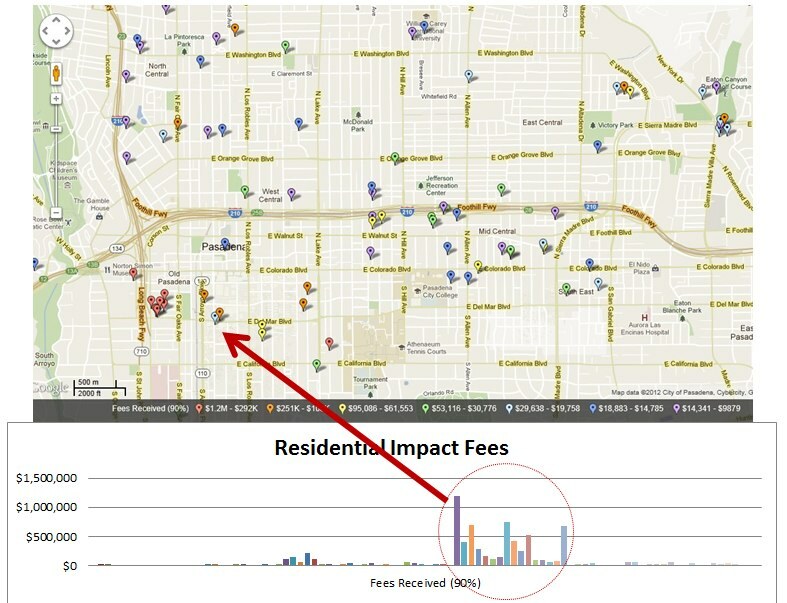 The DPNA believes that the Residential Impact Fees need to be spent close to where they are raised. Downtown Pasadena has a shortage of parks. The “nexus” between new buildings and new residents and the fees that are charged to them needs to be at least partially based on proximity. At least some of the money needs to be spent on parks that are within walking distance of the people that are paying the fees. Thanks to your action last year, at our urging, fees can now be spent on small plazas, pocket parks, and other amenities where land acquisition costs are high. Please reject the ordinance and direct staff to find locations and develop an implementation schedule to build small walkable parks near to the projects that were assessed the fees. 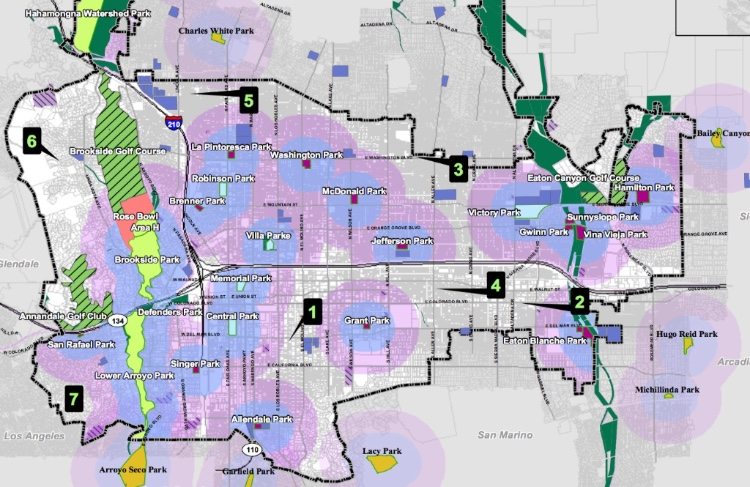 Look to the General Plan to place parks where future development is expected to occur. 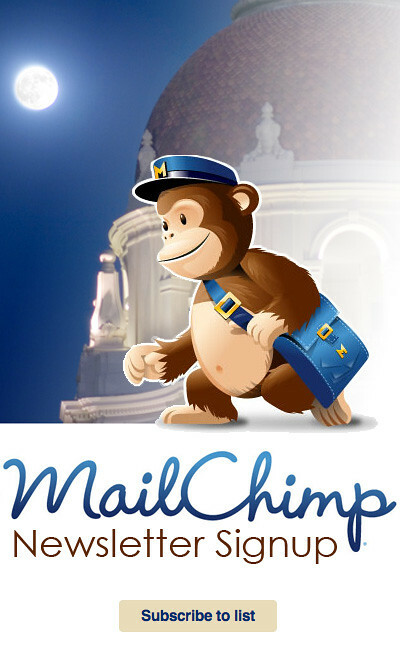 Send me new blog posts!